Pumice from the Home Reef eruption that began early-to-mid August 2006 reached the eastern Australian coast in March 2007. A substantial stranding of the pumice in mid-April extended for more than 1,300 km along the Queensland and northern New South Wales coast. Pumice clasts ranged in size from 1-4 cm in diameter, with the largest clasts up to 17 cm in diameter. A visit to the area in February 2007 revealed a pumice mound barely visible over the waves. Until November 2008 no observations of the Home Reef island had been reported since a visit by Scott Bryan and colleagues in mid-February 2007 (BGVN 32:04), when a small pumice mound less than 5 m above sea level was present at low tide. The island had been constructed during an explosive eruption in August 2006 (BGVN 31:09, 31:10, and 31:12). When Bryan returned on 20 November 2008 the island was no longer present. The summit of the volcano on 20 November was 9-10 m below sea level, forming a relatively smooth-topped summit region approximately 500 x 500 m in area. The top of the summit was located at 18°59.421' S, 174°46.138' W (18.990°S, 17.769°W). The position of the summit are could be detected by a slight "lipping" of the oceanic swell across the top of the seamount, but the area was also obvious due to continued hydrothermal plume activity producing turbid turquoise water. The hydrothermal plume was displaced to the west of the summit area by ocean currents, and the surface area of discolored water was ~1-2 km2. A discharge of H2S associated with the hydrothermal activity was more subdued than in February 2007. Information Contacts: Scott Bryan, Centre for Earth and Environmental Science Research, Kingston University London, Kingston Upon Thames, Surrey KT1 2EL, London, United Kingdom; Allan Bowe, Mounu Island Resort, PO Box 7, Neiafu, Vava'u, Tonga. Observers from a Royal New Zealand Airforce aircraft reported venting and a sulphur smell from Home Reef on 8 December. The island was about 450 m in diameter, circular in shape, and rose to a height of 73 m (240 ft) a.s.l. The water around the island was cloudy with sediment. Pumice rafts originally reported to have been from Metis Shoal are now confirmed to have originated from an island-building eruption of the submarine Home Reef volcano. On 12 August, possibly four days after the beginning of the eruption, a sailor spotted the new island after encountering pumice rafts the previous day. The encounter was written in an on-line journal that described the island as four-peaked. A central crater produced steam plumes and occasional bursts of tephra. Data from the Ozone Monitoring Instrument (OMI) on NASA's Aura satellite showed that sulfur dioxide emissions from the Home Reef area began on 8 August, peaked during 8-9 August, and ceased on 15 August. Based on ASTER satellite imagery from 4 October, the island was an estimated 1 km long with an area of 0.23 square km. The temperature of a small lake on the island was 64.7°C. The island was 0.15 square km, based on ASTER imagery from 12 October. 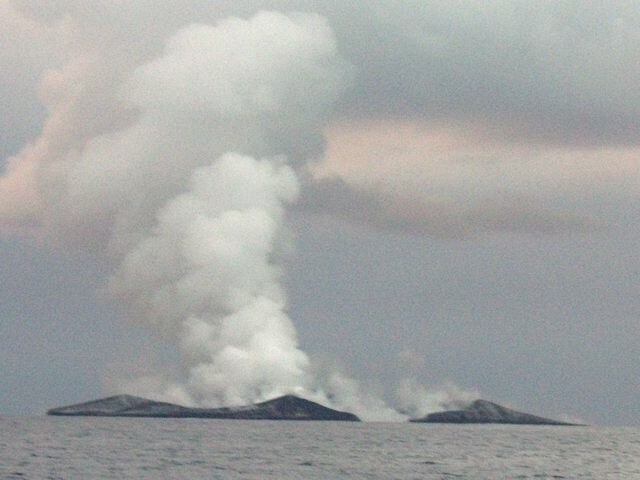 An eruption in the vicinity of Home Reef was reported on 2 March at 1107. Intense submarine activity ejected a plume to an altitude estimated by an airline pilot at more than 7.5 km. A surface layer, probably pumice, extended 60 km to the NE and was 20-30 km wide, enveloping Late Island (25-30 km to the NE). Surface discoloration of the sea covered a larger area. Another report at about the same time described a pumice raft of the same dimensions drifting SW. South Pacific Islands Airways (SPIA) reported that the activity was at 19.0°S, 174.80°W. Gerald Dion piloted Pan American World Airways flight 811 (Honolulu to Auckland) over the area on 3 March at about 0730. From about 18 km upwind, the eruption was visible through broken weather clouds for about 1 minute. A medium-dark reddish-brown eruption column rose from a submarine vent within a horseshoe-shaped island open to the E. The eruption column reached slightly more than 12 km altitude (several hundred meters above the aircraft) where winds carried its top at least 15 km NE. During the morning of 4 March, an SPIA pilot reported that an eruption cloud was still visible, rising high above the sea surface. He saw floating pumice drifting away from the eruption site but no island appeared to have formed. However, before the eruption had ended, by 5 March at 1030, two small islands had formed with a maximum elevation of about 20 m, enclosing a crater about 1,500 x 500 m. Island-forming eruptions of Home Reef occurred in 1852 and perhaps in 1857. Information Contacts: R. Krishna, Fiji Meteorological Service; J. Latter, DSIR, Wellington; G. Dion, Pan American World Airways; Meteorological Office, Tonga; W. Smith, T. Kossarias, FAA, Washington. Tonga government geologist David Tappin reported that brown discolored water preceded the eruption, which started 1-2 March. The new island was visible by 2 March. When Captain Jeff Heard of SPIA flight 607 flew over the eruption site on 5 March at 1030, explosive activity had declined. Weak steaming occurred from a submarine crater surrounded by the new island. In mid-March, a cargo vessel traveling from Tonga to Fiji at 12 km per hour took 9 hours to pass through a zone of pumice. Samples were collected from this vessel about 150 km W of Tonga. Pumice rafts were reportedly sighted at Oneata Island, Lau Group (18.45°S, 178.50°W, roughly 500 km WNW of Home Reef) on 5 April. On 1 May, ships between Tonga, Fiji, and Samoa reported that floating pumice was so thick that it was clogging their seawater intake systems. RNZAF personnel flew over the new island 23 March. They gave its location as 19.02°S, 174.73°W, about 10 km S of Late Island. Dimensions of the new island were estimated at 1500 m by 500 m, with cliffs about 30-50 m high (figure 1). Discolored water just NW of the island suggested submarine activity. Photographs taken from upwind showed the island to be yellowish brown in color, but atmospheric haze caused it to appear dark brown from downwind. David Tappin reported that activity was continuing in early April. Figure 1. RNZAF photo of the new island formed by the Home Reef eruption, taken 23 March 1984 from about 300 m altitude. The island trends approximately N-S, with N at right. Courtesy of W/O P.J.R. Shepherd and J.H. Latter. The RSP did not record any seismicity from the eruption. Islands and deep water between Tahiti and Tonga prevented RSP stations from recording any acoustic waves (T-phase). Information Contacts: D. Tappin, Ministry of Lands, Survey, and Natural Resources, Tonga; P. Shepherd, RNZAF; J. Latter, DSIR, Wellington; J. Lum, Ministry of Energy and Mineral Resources, Fiji; R. Krishna, Fiji Meteorological Service; J. Talandier, Lab. de Geophysique, Tahiti; N. Banks, HVO, Hawaii. Large rafts of floating pumice probably from the early March eruption of Home Reef were reported in the Fiji area through early July. The press reported that pumice was first sighted in waters near the Lau island group (roughly 400 km WNW of Home Reef) in April. By early May, large pumice rafts in several regions of Fiji were forcing ships to return to port, and pumice covered the shoreline of many islands. The Fiji press also reported that pumice had reached Vanuatu and the Solomon Islands by early May. From a ship on 2 May, David Tappin observed pumice rafts about 100 m long and 20 m wide just outside the harbor at Suva (Fiji's capital, about 750 km WNW of Home Reef). Flying from Suva to Tonga on 12 May, Tappin saw 5-10 similar en echelon rafts between Suva and about 19°S that appeared to be moving WNW or W. A large kill of deep-sea fish was reported at Oni-i-Lau (at the south end of the Lau islands) at the end of May. Thick layers of pumice had accumulated at the shoreline, strong enough to support the weight of adults. Tides and winds carried a thick blanket of pumice into Suva harbor 24 June, but officials said that by then there was less pumice in the Fiji area than in April. Information Contacts: P. Rodda, Mineral Resources Dept., Fiji; D. Tappin, Ministry of Lands, Survey, and Natural Resources, Tonga; R. Krishna, Fiji Meteorological Service; Fiji Times. Large quantities of pumice, probably from the early March eruption of Home Reef, began to arrive about 10 April at Futuna Island (14.42°S, 178.33°W) and Alofi Island (14.45°S, 178.08°W), roughly 700 km NW of Home Reef. ORSTOM geologists collected samples of pumice fragments that were typically 3-4 cm in diameter but occasionally reached 15-20 cm in largest dimension. During fieldwork on Futuna and Alofi islands in July, ORSTOM personnel saw pumice accumulations as much as 30 cm thick on the upper parts of some beaches. People aboard a ship that left Fiji in early May saw pumice as far west as 100 km from Vanuatu about 8 May. Arrival of pumice in Vanuatu was reported in late June. It was apparently found mainly in the central part of the island group in the vicinity of Efate (17.75°S, 168.3°E) and the Shepherds, about 1,800 km WNW of Home Reef. The pumice seemed to move as discontinuous "streamers," but was as much as 0.25 m thick on parts of some beaches. Information Contacts: P. Maillet, J. Eissen, M. Monzier, ORSTOM, New Caledonia; A. Dahl, Noumea, New Caledonia; A. McCutchan, Dept. of Geology, Mines, and Rural Water Supplies, Vanuatu; G. Greene, USGS, Menlo Park CA. Pumice that was probably from the March eruption of Home Reef was collected in August at Beautemps-Beaupré (northern Loyalty Islands, 20.4°S, 166.2°E) and on 3 September at Yate (southern New Caledonia, 22.15°S, 167.00°E), both roughly 1,300 km WSW of Home Reef. Fishermen reported that pumice arrived at Yate by 19 August or 1-2 days earlier during a few days of rough seas. The largest pumice fragment found was 9 cm long but the pumice averaged 1-2 cm in diameter. Small shells up to 1 cm long were frequently attached to the pumice. As of mid-September, no pumice had arrived in the Solomon Islands, roughly 2,600 km NW of Home Reef. Information Contacts: P. Maillet, J. Eissen, and M. Monzier, ORSTOM, New Caledonia; D. Tuni, Ministry of Lands, Energy, and Natural Resources, Solomon Islands. While traveling southeast of Fiji in May, June, and July, Dutch ships encountered rafts of floating pumice, probably from the March eruption of Home Reef. On 15 May between 0100 and 0530, the MV Amanda Smits traveled through floating pumice from 18.10°S, 178.90°E to 18.78°S, 178.17°E, about 675 and 740 km WNW of Home Reef. The pumice ranged in size "from grit to large dice". A volunteer meteorological observer aboard the MV Nedlloyd Alkmaar reported that the vessel first encountered pumice on 8 June at 0800 at 21.58°S, 177.85°W (about 430 km SW of Home Reef). Steaming on a course of 282° (slightly N of W), the ship continued to pass through pumice rafts of varying density for nearly 280 km, with the last observation on 8 June at 1800 at 21.03°S, 179.53°E (about 635 km WSW of Home Reef). Pumice fragments ranged in size from "fine grit" to about 10 cm in diameter. Live shellfish up to 1 cm across that looked like mussels were attached to some pumice fragments. The MV Nedlloyd Barcelona sailed through small amounts of pumice 21 July; her positions at 0700 and at 1300 were 22.4°S, 178.7°E and 24.0°S, 178.7°E, about 775 and 875 km SW of Home Reef. Pumice fragments reached a maximum size of 2-3 cm and were aligned in E-W strands up to several hundred meters long. Information Contacts: L. Mahieu, Royal Netherlands Meteorological Inst. Fragments of pumice were found in early 1985 at three sites in the Solomon Islands. Pumice fragments found near the high water mark were without attached shellfish, but those found lower on the beach were encrusted with barnacles of the genus Lepas that were up to about a cm in length, suggesting that they had been in the water for a few months or more. Since the March 1984 eruption of Home Reef, floating pumice has been found in numerous locations to the SW and NW, as far away as 1,800 km (Efate Island, Vanuatu in late June). Large quantities of pumice were found by Henry Isa on the SE coast of Alu Island at Aleana village (7.1°S, 155.75°E, about 3450 km WNW of Home Reef). Mr. Isa saw the pumice by 31 January, but its date of arrival was not known. A large amount of pumice was also present at Koela village on the SW coast of Savo Island (9.1°S, 159.8°E, about 2,950 km WNW of Home Reef) when Alison Papabatu visited the island 27 February. Lesser quantities of pumice were found 19 March and collected by Deni Tuni on Savo's SE coast at Kolika village. Residents of the island did not know when the pumice had arrived. No fresh pumice was found along the E side of Savo Island, nor had any been seen at Honiara, Guadalcanal Island, about 30 km SE of Savo. Further Reference. Rodda, P., 1986, Home Reef Pumice in Fiji (second edition); Mineral Resources Dept. Note BP1/58, 5 pp. Information Contacts: Deni Tuni, Ministry of Natural Resources, Solomon Islands. Pumice rafts drifting from Tonga to Fiji occurred during August-October 2006. The source of these pumice rafts was Home Reef, which was first observed to be in eruption on 9 August and was clearly building an island by 12 August (figure 2). A compilation of report sightings through mid-October 2006, plotted using Google Earth, shows the timing and distribution of the pumice rafts that are discussed in this report (figure 3). As is our convention, and as available, a list of contributors (and their vessels) is noted in last section of this report. Pumice traveled both N and S around Fiji's Lau Group. To the N, pumice reached Taveuni through the Nanuku passage and entered the Koro sea, washing onto southern Vanua Levu, before moving into the Bligh Waters N of Viti Levu by 20 September. To the S, extensive pumice was seen N of Vatoa Island on 16 September, and on Kadavu Island by the end of the month. Pumice was also encountered by the Encore II W of Viti Levu on 30 September while enroute to New Caledonia. Figure 2. Photograph of the new island being built by the eruption at Home Reef as seen on 12 August 2006. The island was ~1.5 km in diameter. View is towards the W from about 2.8 km away. Courtesy of Fredrik Fransson of the Maiken. Figure 3. Map of Tonga (right) and Fiji (upper left) showing dates and locations where observers saw pumice rafts (placemarks with dots) or where mariners crossing between Tonga and Fiji failed to see rafts (placemarks with crosses). Some locations are approximate; see text for additional details and sources of each observation. The base map is from Google Earth with points plotted by Bulletin editors. Early observations of the eruption. The news service Matangi Tonga Online quoted Allan Bowe, the owner of the Mounu Island Resort in southern Vava'u, regarding volcanic activity in the direction of Home Reef during 9-11 August. Bowe heard ". . . what sounded like continuous thunder rumbling to the S and there was a huge plume of smoke and cloud rising up into the sky." In another Matangi news article, Siaosi Fenukitau, a captain of one of the fishing boats of the Maritime Projects Co. (Tonga) Ltd., reported that around mid-September they sighted a new volcanic island near Home Reef that was larger than Fotuha'a, a small island in Ha'apai with a population of about 134 people. The yacht Maiken left Neiafu on 11 August, passing the N side of Late Island. After about 9 km the crew noticed brown, somewhat grainy streaks in the water. The streaks became larger and more frequent as they continued SW "until the whole horizon was a solid line to what looked like a desert." The brownish pumice fragments the size of a fist were floating in water that was strangely green. They motored into the vast (many miles wide) belt of densely packed pumice, and within seconds Maiken slowed down from seven to one knot. Initially the thin layer on the surface was pushed away by the bow wave, but when they entered the solid field it started to pile up and "behaved like wet concrete" and "looked like rolling sand dunes as far as the eye could see." After retreating from the pumice with only minor paint abrasion along the waterline, and then cleaning their intake filters, they decided to anchor in Vaiutukakau bay outside Vava'u for the night. The next morning, 12 August, they received radio confirmation of an eruption, but the vent and extent were uncertain. They decided to go S to avoid the pumice rafts floating NW, heading SSW until they encountered the pumice, then sailing alongside until the rafts were broken up enough to safely travel through. As they approached Home Reef it became clear that one of the clouds on the horizon was a volcanic plume. Observations from a closer vantage point revealed that an intermittent "massive black pillar shot upwards toward the sky" and particles were raining down. Since the wind was pushing the plume NW, the Maiken motored up to within 2.8 km of the island (to 18°59.5'S, 174°46.3'W) while the sun was going down. Multiple peaks forming a crater open to the sea on one side were visible, and it looked like it was "made of black coal." Not wanting to encounter more pumice rafts after dark, they continued SSW towards the southern part of the Lau Group. Pumice sightings between Tonga and Fiji. Boats that later noted seeing pumice in Fiji did not report any activity or rafts near Tonga during 27-29 August. The Soren Larsen sailed through "a sea of floating pumice" one evening that "sounded like we were sailing through ice" just before reaching Fiji. This encounter was probably on 30 August when their online tracker located the ship just W of the central Lau islands after departing Neiafu on the 28th. No eruptive activity or pumice was noted in the online log of the Soren Larsen for 14-15 and 23-24 August when they transited to northern Tonga to the E of Home Reef. While the Encore II crew was visiting the Mounu Island Resort on 2 September there were "grapefruit-sized" pumice pieces on the beach. A few days later, while listening to the "Rag of the Air" net broadcast out of Fiji, the Encore II crew learned of pumice rafts along their expected route. The operator of this broadcast, Jim Bandy, provides weather reports for boats going between Tonga and Fiji. One report was of a mass of pumice about 11 km long and at least a meter ("many feet") deep. The Encore II departed from Neiafu on 8 September on a course around a set of Fijian islands and reefs called the Lau Group. The crew believed that this route, going NW around the Lau Group, helped them avoid most of the pumice. As the Encore II approached their turning point about two thirds of the way to Fiji, on 10 September, they encountered "rivers of pumice" floating roughly parallel to their NW course due to the SE winds (figure 4). Some pumice fragments that they collected were about 5-10 cm in diameter, although most were about the size of pea gravel. The parallel streams of pumice, only a single layer in depth, were sometimes up to 90 m wide and 400 m long. The crew later heard reports from several boats that had taken a more westerly route through the Lau Group to Fiji and encountered much larger areas of pumice. The crew on the Norwegian sailboat Stormsvalen went through larger and thicker areas of pumice, leaving a track in the pumice as they went through (figures 5 and 6). They noted that boats traveling through the pumice during higher winds and seas encountered a problem of airborne pumice pelting the crews and their boats. One crew reported pumice covering their deck. Figure 4. Photograph showing small areas of floating pumice just NE of the Lau Group of islands, Fiji, around 10 September 2006. Courtesy of the Encore II crew. Figure 5. Photograph showing a large pumice raft near the Lau Group of islands, Fiji, on an unknown date in early to mid-September 2006. Courtesy of the Stormsvalen crew via the Encore II. Figure 6. View of a large pumice raft after the passage of a sailing vessel near the Lau Group of islands, Fiji, on an unknown date in early to mid-September 2006. Courtesy of the Stormsvalen crew via the Encore II. A sailboat blog entry by Sara Berman and Jean Philippe Chabot noted a "strong sulfur odor" in the direction of the volcano upon leaving Tongan waters around 20 September. As they progressed SW towards Fiji they passed through streams of pumice containing pieces ranging from very small pebbles to larger pieces the size of a baseball. Every time a wave crashed on deck they heard the pumice making its way onto the boat and into the cockpit.On 30 September the Windbird log noted that ". . . cruisers are still having to avoid the huge pumice field that is floating about between Tonga and Fiji." Bob McDavitt's "Weathergram" for 15 October noted that reports from yachts sailing between Tonga and Fiji indicated an absence of pumice. These observations suggest that the bulk of material produced by the eruption, or series of eruptions, had crossed to Fiji by mid-October. Pumice rafts in northern Fiji. The earliest known direct observations of the floating pumice in Fiji come from a boat with callsign KB1LSY, the crew of which noted that "thick pumice" slowed them to 2 knots for 30 minutes during the early morning hours of 28 August. This occurred as they approached the northern islands of the Lau Group in Fiji, about 500 km NW of Home Reef. According to Roberta Davis, the pumice arrived at Taveuni, Fiji, on 14 September. There were several rafts ~300 m from shore with other rafts scattered farther out. Local mariners noted that pieces in the top layer were approximately the size of pea gravel. Suspended below the surface were pieces almost as large as footballs. 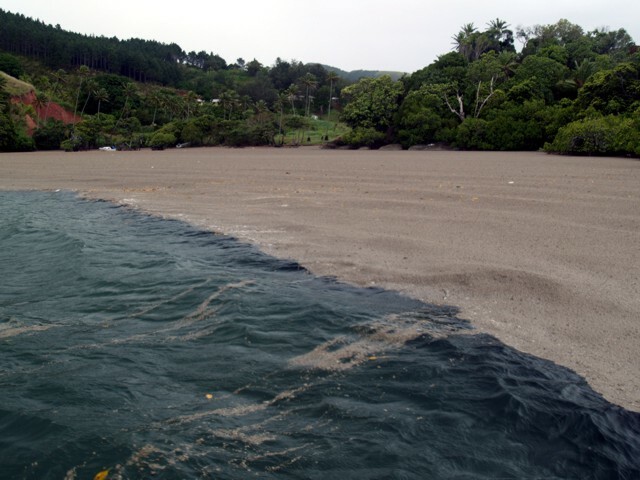 The beaches on the northern shores of Taveuni were covered in what appeared to be black popcorn. The pumice was present at Taveuni for up to 6 days. On 19 September David Forsythe reported that large rafts of pumice were passing through the northern Lau group in Fiji (figure 7). He noted gooseneck barnacles up to 10 mm long on the largest pieces. Bulletin editors found compiled growth rates for various stalked barnacles ( Thiel and Gutow, 2005), which indicated 17-29 days of growth. Figure 7. Panoramic view of Indigo Swan Beach filled with pumice, Naitauba Island, Fiji, as seen in September 2006. Courtesy of David Forsythe. The Encore II crew observed pumice along the S side of Vanua Levu, W of the Lau Group, around 16 September. They noted pumice at Fawn Harbour that obscured the channel into the harbor and it made a boat at anchor appear to be aground on an island. They also observed streams of pumice near the Makogai Channel on 20 September. The Fiji Times Online reported on 20 September that villagers living along the coastal areas of Saqani in Cakaudrove (Vanua Levu) were battling to clear their pumice-covered seashores and rivers. Villagers saw the pumice floating in the sea near their homes on 18 September, and by the next day the pumice covered the river and villagers could not fish or travel by boats and bamboo rafts to their plantations. While diving at the "Bligh Triangle" of Fiji at sites NW of Viti Levu, the crew aboard the Nai'a encountered floating pumice during 20 September-7 October. The pumice was "surrounding the Nai'a and the skiffs with occasional big carpets of floating rock." Roman Leslie, an Australian volcanologist who was fishing in Koro (Lomaiviti Group), also observed the pumice in late September.Scientists aboard the research vessel Yokosuka observed pumice settling to the shore of Viti Levu on 6 October. The rafts were in bands up to 70-80 m wide and several hundred meters long. The pumice fragments were fully abraded, and dominantly less than 1 cm in diameter with occasional large blocks up to 15-20 cm in diameter. The pumice seemed to be quite phenocryst-rich. The sound of the moving, abrading rafts was described as "sizzling." Pumice rafts in southern Fiji. A biologist aboard the National Geographic motor vessel Endeavour reported that on the morning of 16 September they observed an extensive region of floating pumice "... in long, wind-driven rows, approximately 1-5 m wide and up to several hundred meters long." Pieces of pumice averaged 0.5-8 cm in longest dimension. The largest piece observed was approximately 15 cm in longest dimension. The observations continued over the next 90 km, for 3.5 hours, with little interruption, until they made landfall at Vatoa Island in the Lau Group. Moderate windrows of pumice, up to several inches deep, were observed on the beaches of Vatoa. Roger Matthews arrived in Kadavu, Fiji, on 30 September and reported that pumice had been coming ashore for about a week. On the southern coast of the island near the airport, the layer of pumice on 30 September was 10-15 cm thick floating on top of ~1 m of water (figure 8). Farther NE, pumice that began coming ashore at the Matava Resort on 3 October carried goose barnacle shells that measured about 2-3 mm on the bigger clasts. By 7 October barnacle size on arriving pumice had increased to around 4-6 mm. While scuba diving, Matthews noted neutrally buoyant bits of pumice, generally in the 3-10 mm size range, down to at least 40 m water depth. The pumice did not appear to have an even size distribution (figure 9). There were a number of big clasts, 2-3 cm, with a large amount of material in the 8-15 mm range. In the shore deposits there appeared to be a large volume of fines in the sub-2 mm size. The material was clean with no algae, just the occasional barnacles. The clasts contained phenocrysts up to 2 mm long. The raft drifted in and out depending on wind conditions, at times extending 75-100 m from shore, and invaded streams at high tide. On shore there were 20-cm-thick deposits, some of which was used as fill behind the sea walls (figure 10). Figure 8. Pumice found floating in North Bay along the southern coast of Kadavu, Fiji, on 30 September 2006. Courtesy of Roger Matthews. Figure 9. A close up view of pumice seen near Matava Resort on the S shore of Kadavu, Fiji, 3 October 2006. Courtesy of Roger Matthews. Figure 10. Pumice deposits seen at ebb tide near Matava Resort on the S shore of Kadavu, Fiji, 8 October 2006. Some of the pumice has been used as fill behind the sea wall. Deposits can be seen on the steps into the water, and waves propagating through the pumice could still break. Courtesy of Roger Matthews. A 31 October story in the Fiji Times described transportation difficulties between Daviqele Village, on the W end of Kadavu, and other parts of the island due to pumice that a resident said had "covered [Naluvea Bay] for over two months now." Similar problems were reported by Adrian Watt at Matava Resort on the S shore of Kadavu. In an email relayed by Roberta Davis, Watt noted that by 2 November the pumice had mostly stopped coming in, with "... just a few strands of small pieces being blown along wind lines here and there." The pieces were generally 5-10 mm in diameter, but several were bigger, and one was larger than 30 cm across. Large bays on Kadavu's SE side were pumice choked, hampering boat travel, and clogged cooling systems damaged or destroyed many outboard engines. Reference. Thiel, M., and Gutow, L., 2005, The ecology of rafting in the marine environment. II. The rafting organisms and community: Oceanography and Marine Biology: An Annual Review, 2005, v. 43, p. 279-418. Information Contacts: Fredrik Fransson and Håkan Larsson, Yacht Maiken, 32 Macrossan St., Unit 70, Brisbane 4000, Australia (URL: http://yacht-maiken.blogspot.com/); Paul and Nancy Horst, Encore II (URL: http://www.encorevoyages.com/); KB1LSY Crew (URL: http://www.pangolin.co.nz/yotreps/tracker.php?ident=KB1LSY); Matangi Tonga Online, Vava'u Press Ltd., PO Box 958, Nuku'alofa, Tonga (URL: http://www.matangitonga.to/); Roger Matthews, Private Bag 93500, Takapuna, North Shore City 1332, New Zealand; Ken Tani, R/V Yokosuka; David Forsythe, Naitauba Island, Fiji; David Cothran, 1211 Colestin Rd., Ashland, OR 97520, USA; Bob McDavitt's Weathergram (URL: http://www.pangolin.co.nz/yotreps/list_manager.php##Bob McDavitt's Pacific Weathergrams); Nick Sambrook, Tall Ship Soren Larsen, P.O.Box 60-660 Titirangi Auckland 0642, New Zealand (URL: http://www.sorenlarsen.co.nz/2006/V237_Tonga-Fiji/V237_Tonga-Fiji_Nick.htm, http://www.sorenlarsen.co.nz/Voylog_Track.htm); Windbird Crew (URL: http://handleysail.com/logs/?cat=1&paged=2); NAI'A Liveaboard Scuba Diving, Lautoka, Fiji (URL: http://www.naia.com.fj/); Roberta Davis, Makaira by the Sea, Taveuni, Fiji (URL: http://www.fijibeachfrontatmakaira.com/); Adrian Watt, Matava Resort, Kadavu, Fiji (URL: http://www.matava.com/); Sara Berman and Jean Philippe Chabot (URL: http://zayasail.blogspot.com/2006/09/east.html). An eruption from Home Reef in early August generated large volumes of pumice that floated to Fiji (over 700 km away) in the following two months; an island was also created (BGVN 31:09). Satellite data and imagery have been used to confirm these observations and provide additional information about this event. Norman Kuring of the MODIS Ocean Color Team identified the earliest clear shot of the pumice raft in a Terra MODIS on 7 August at 2120 UTC (8 August at 1020 Tonga time). The image (figure 11) shows a circular patch of pumice over the eruption site with a small volcanic plume emerging from it. The first indication of pumice raft leaving the eruption site is in the Aqua MODIS image at 0132 UTC on 10 August, but the 9 August overpass was cloudy, so it could have happened earlier. Kuring also compiled other images showing the dispersion of the pumice through 22 August (figure 12). Figure 11. Terra MODIS image taken on 8 August 2006 (local time) showing the early stages of the eruption at Home Reef. A steam plume is visible rising from the southern end of a mass of floating pumice covering an area larger than Late Island to the NW. Courtesy of the NASA Ocean Color Group. Figure 12. Terra and Aqua MODIS satellite images showing the dispersion of the pumice raft generated by the eruption at Home Reef during 7-8 August. By 10 August a large raft was NE of Late Island. Most of the material stayed in that area through 12 August before breaking up into elongate pieces that began moving W towards Fiji. Courtesy of the NASA Ocean Color Group. Kuring also made a preliminary estimate of the area of the pumice raft on 11 August (10 August at 2150 UTC), previously encountered by the Maiken (BGVN 31:09). A mask was created to cover identifiable areas of pumice, resulting in an area of 9,338 pixels. Each pixel in the image used covers an area of 0.0468 km2. The calculated total area is approximately 440 km2 for that time. Note that this estimate does not take into account errors caused by pumice being a high-contrast target (allowing linear patches less than the pixel width to be seen), small isolated patches of pumice that could not be recognized, material hidden by clouds, or fragments suspended in the water column under the surface. In the 8 August MODIS image, the circular area was determined by Bulletin editors to be at least 8 km in diameter, so the area covered was more than 50 km2. Simon Carn (UMBC) used the Ozone Monitoring Instrument (OMI) on NASA's Aura satellite to constrain the timing of the eruption. OMI detected SO2 emissions from the vicinity of Home Reef beginning on 8 August. Emissions appear to have peaked sometime during 8-9 August. The total SO2 mass detected E of Tonga by OMI on 9 August was ~ 25 kilotons. By 12 August there were 3.3 kilotons of SO2 in the area (figure 13). The emission episode was over by 15 August. HYSPLIT forward trajectories indicated that the SO2 released on 8 August may have reached altitudes of 5 km or more. Carn also stated that "To our knowledge this is the first example of satellite detection of emissions from a submarine volcano. Significant scrubbing of SO2 and other soluble volcanic gases is likely during such events." Figure 13. Sulfur-dioxide emissions in the vicinity of Home Reef, 12 August 2006 at 0140 UTC. Data obtained from the Ozone Monitoring Instrument (OMI) on NASA's Aura satellite. Courtesy of Simon Carn. Terra MODIS data from 4 September 2006 provided by Alain Bernard showed pumice rafts moving SE from Home Reef (figure 14). Pumice that previously followed a similar path was found on beaches in southern Vava'u (BGVN 31:09) by 2 September. Figure 14. Terra MODIS data from 4 September 2006 showing pumice rafts moving SE from Home Reef. Data was obtained with a simple processing of bands 1 and 2; pixel size is 250 meters. Courtesy of Alain Bernard. Island evolution. No data or reports are available to determine when the island built by the 1984 eruption (SEAN 09:02 and 09:04) eroded below the ocean surface. Recent reports from mariners and local fishermen noted that this current eruption had built a new island, implying the absence of an island at that location. An ASTER image inspected by Matt Patrick from 18 November 2005 did not show an island. An ASTER image of the new island taken on 4 October 2006 (figure 15) has been studied by a number of scientists, including Greg Vaughan (JPL), Matt Patrick (Michigan Tech), and Alain Bernard (Univ. of Brussels). The image clearly shows the island (at 18.991°S, 174.762°W) with large ? and NE-directed anomalous areas that are likely caused by volcanic material suspended in the water. The new island is warmer than adjacent Late island. Greg Vaughan provided an annotated version of the image zoomed in on the new island, which he computed then had an area of 0.245 km2. Vaughan also noted that the "daytime image shows considerable activity in the water around the new Home Reef island [and] a thermal plume in the same shape as the pink colored area in the attached VNIR images (ASTER channels 3-2-1 as R-G-B)." Work by Alain Bernard based on the ASTER thermal bands determined that the hot lake on the island had a maximum temperature of 64.7°C on 4 October. Bernard calculated the island area to be 0.230 km2 on 4 October. Comparison with another ASTER image from 12 November showed that the island had changed shape and covered an area of 0.146 km2, a decrease of 0.084 km2 (figure 16). Figure 15. ASTER VNIR image showing the new island at Home Reef on 4 October 2006. A volcanic lake is visible on the island, as are submarine plumes originating from the island. Some possible small pumice rafts can also be identified in this 15-m imagery. Modified from original provided courtesy of Greg Vaughan. Figure 16. Comparison of the island at Home Reef on 4 October (left) and 12 November 2006 (right) using ASTER imagery. The size of the island decreased approximately 0.84 km2 over that time period. Courtesy of Alain Bernard. Floating pumice observations. Additional pumice sightings have been reported that supplement those described earlier (BGVN 31:09). Areas known to have been impacted by the pumice now include Suva Point (where the capital of Fiji, Suva, is located) and Yasawa Island (N of Viti Levu and E of Vanua Levu). By early November pumice from Home Reef had reached Efate Island in Vanuatu. Crew on the SV Sandpiper encountered pumice during transit from Tonga to northern Fiji on 12 September. They went through "large patches" of pumice "all afternoon" while traveling about 200 km over the course of the day. The next evening, after sunset on 13 September, the boat suddenly slowed and the water "looked like a thick chocolate shake." Lights shining down from the rigging (spreader lights) showed that they were surrounded by pumice. The crew observed pumice again on 23 September at the southern end of Vanua Levu. Wally Johnson was flying from Suva to Taveuni on 19 September and observed large amounts of pumice in the Koro Sea, drawn out into numerous parallel strings in the direction of the prevailing wind and heading towards Taveuni. A fair bit of the pumice had been washed up into ridges on beaches on the NW coast of Taveuni, and up and into pockets on some of the recent basaltic lava flows to the SW. Bernie Joyce forwarded additional reports from Fiji. On 27 October 2006, Rebekah Mue-Soko reported that the Suva Point area of Viti Levu was filled with pumice as of 27 October, and that it had appeared sometime before 8 October. About 6 November 2006 Lyn and Darcy Smith were on the Fijian island of Yasawa, N of Viti Levu, and reported "a heap of pumice on the beach" which apparently arrived during their one-week visit. While pumice has persisted in Fiji, some reached Vanuatu. Sandrine Wallez reported pumice on the W coast of Efate Island during the night of 4-5 November. A deposit around 10 cm thick was observed along 40 km of coastline. The largest pumice fragments were the size of a tennis ball. Pumice was still on the beaches in early December (figure 17). Shane Cronin was in Vanuatu in early October when a new batch of fresh pumice washed up on northern Efate beaches. Pumice is commonly being deposited on beaches around Vanuatu, and local residents told Cronin that they thought it was coming from up around the Ambrym-Lopevi area. Douglas Charley (DGMWR - Vanuatu) recorded explosion earthquakes on a portable geophone from south Epi (BGVN 29:04) at the beginning of September. Figure 17. Photograph showing beach deposits of pumice from the August eruption at Home Reef on western Efate, Vanuatu, on 3 December 2006. Courtesy of Sandrine Wallez. Information Contacts: Simon Carn, Joint Center for Earth Systems Technology, University of Maryland-Baltimore County (UMBC), 1000 Hilltop Circle, Baltimore, MD 21250, USA (URL: https://jcet.umbc.edu/); Norman Kuring, NASA/Goddard Space Flight Center, Code 970.2, Greenbelt, MD 20771, USA; Greg Vaughan, NASA Jet Propulsion Laboratory, California Institute of Technology, 4800 Oak Grove Dr., Pasadena, CA 91109-8099, USA; Alain Bernard, IAVCEI Commission on Volcanic Lakes (CVL), Université Libre de Bruxelles (ULB), CP160/02, avenue F.D. Roosevelt 50, Brussels, Belgium (URL: http://www.ulb.ac.be/sciences/cvl/homereef/homereef.html); Sandrine Wallez, Department of Geology, Mines, and Water Resources (DGMWR), Port-Vila, Vanuatu; R. Wally Johnson, 45 Alroy Circuit, Hawker, ACT 2614, Australia; Shane Cronin, Institute of Natural Resources, Massey University, Palmerston, New Zealand; Tom and Amy Larson, SV Sandpiper (URL: http://sandpiper38.blogspot.com/2006_09_01_sandpiper38_archive.html); E.B. Joyce, School of Earth Sciences, The University of Melbourne, VIC 3010, Australia (URL: http://earthsci.unimelb.edu.au/home). The island built by the eruption from Home Reef in early August (BGVN 31:09 and 31:10, table 1) was directly observed on 14 November and 7 December. No additional information about the eruption site has been received after 7 December. Table 1. Summary of activity at Home Reef, August-December 2006. Only near-source observations are included, not dispersed pumice sightings. Revised area calculations were made using a Google Earth tool. Data supplemented, especially with additional satellite observations, from a table originally prepared by Paul Taylor. 05 Aug 2006 MODIS satellite image shows no activity. 08 Aug 2006 At 1020 local time (2120 UTC on 7 Aug) MODIS image shows eruption plume surrounded by roughly 8-km-diameter circular pumice raft (55 km2). The diffuse eruption plume was seen in imagery extending 80 km SSW and 70 km SSE. MODIS image at 1445 (0145 UTC) showed larger pumice raft still attached to vent, and diffuse plume visible to 300 km S. SO2 first detected by OMI on Aura satellite. Late in the afternoon a continuous rumbling like thunder was heard from Vava'u; red glow was seen on the horizon that evening. 09 Aug 2006 Continuous rumbling like thunder to the S of Vava'u, large mushroom-shaped eruption plume was being ejected above the vent in the morning. MODIS imagery at 1103 local time (2203 UTC on 8 Aug) showed that the pumice raft was still attached to vent, but had drifted to the W and was approximately 150 km2. White eruption plume quickly lost in cloud cover. SO2 mass (determined by OMI) detected E of Tonga was ~ 25 kilotons. 10 Aug 2006 Continuous rumbling like thunder to the S of Vava'u. MODIS imagery at 1432 (0132 UTC) shows that a large pumice raft has moved N of Late Island (20 km NE). Some pumice remains around vent site, but is hidden by eruptive plume. 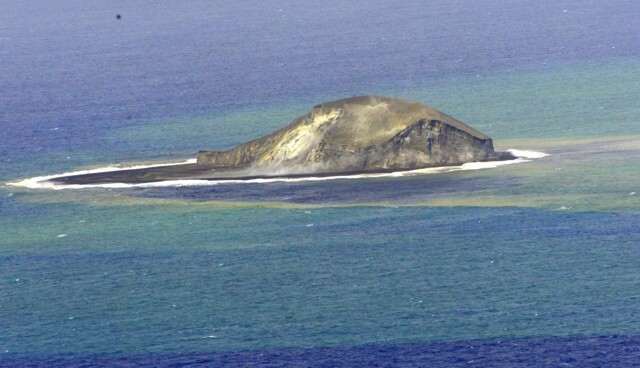 Submarine plume of discolored water extends to Late Island. Diffuse plumes extend at least 100 km SE and 330 km NW. 11 Aug 2006 Continuous rumbling like thunder to the S of Vava'u, large eruption plume above the vent. MODIS imagery at 1052 (2152 UTC on 10 Aug) showed a thin white eruption plume directed 25 km SW before being lost in cloud cover. No significant pumice raft seen near the vent, but there was an extensive area (150 km2) of discolored water surrounding the site. 12 Aug 2006 Eruption column moving NW reported by crew of the yacht Maiken. Surtseyan explosive jets being emitted, producing projectiles that fell to the sea around the vent area. Multiple peaks had formed around a central crater that was open to the sea on one side. The island was about 1.5 km in diameter. OMI detection of SO2 shows 3.3 kilotons in the area. 14 Aug 2006 MODIS image at 1405 (0105 UTC) shows small E-directed white plume, probable island, and large area of strongly discolored water (30 km2) E of the island. Sinuous submarine plume of discolored water extends 60 km NW. 16 Aug 2006 Island was completely covered by clouds in a MODIS image at 1110 (2210 UTC on 15 Aug), but a plume of discolored water stretched more than 50 km N to some pumice rafts. 17 Aug 2006 MODIS imagery at 1435 (0135 UTC) revealed meteorological clouds streaming from Late Island and Home Reef. Discolored water throughout the area N towards Late, and extending 80 km N to large pumice rafts. No significant pumice rafts seen near the island. 19 Aug 2006 No eruption plume seen from island in MODIS imagery at 1425 (0125 UTC). Weakly discolored water patches extending NNW. 22 Aug 2006 Small whitish cloud attached to island seen in MODIS image at 1030 (2130 UTC on 21 Aug) may be meteorological (similar clouds attached to Late). Strongly discolored water in narrow submarine plume very coherent to 8 km NE before diffusing and moving NW. 23 Aug 2006 MODIS imagery at 1115 (2215 UTC on 22 Aug) very cloud-covered, but large zone of discolored water located N of the island. 27 Aug 2006 Island present on MODIS image at 1050 (2150 UTC on 26 Aug) with a coherent submarine plume being dispersed to the N.
mid-Sep 2006 Island reported present at the site of Home Reef by Tongan fishing vessel. 20 Sep 2006 "Strong sulfur odor" noted by a yacht passing W of the volcano. 04 Oct 2006 Several submarine plumes observed on ASTER images. The island present was oval in shape, with the long axis orientated NE-SW. The island measured about 800 x 400 m and covered an area of 0.23-0.26 km2. Several small lakes were present within the island. 12 Nov 2006 No activity observed on ASTER images. Island was still present but with no crater lakes. The island was triangular in shape and covered an area of 0.146 km2. 14 Nov 2006 Island observed by Defence Force patrol boat was ~40 m high, square in shape, 300 m on a side. The island looked quite consolidated. Plume of smoke/steam, but no eruptive activity. 07 Dec 2006 Overflight by a RNZAF Orion revealed a roughly circular island, 450 m in diameter, at 18°59.4'S 174°45.4'W. The crew estimated the height as "up to 240 ft" (75 m). Minor fumarolic activity was occurring in the crater and there was a noticeable smell of sulfur. Sediment/hydrothermal plumes were present in the surrounding waters. Paul Taylor reported that the Home Reef island was observed on 14 November by a Tongan Defence Force patrol boat. The island was reported to be ~ 40 m high, roughly 300 x 300 m at that time, and looked quite consolidated with pumice on the outside, while the center looked "more substantial." Although not in eruption, a considerable plume of smoke/steam was being emitted. The island was photographed on 7 December 2006 (figure 18) by the Royal New Zealand Air Force (RNZAF) at the request of volcanologists from the Institute of Geological & Nuclear Sciences (IGNS). Satellite imagery on 4 October showed an island about 0.24 km2, which decreased by about one-third to 0.15 km2 by 12 November. The RNZAF Orion crew reported that the roughly circular island was 450 m in diameter (0.16 km2), with a maximum height of 75 m (figure 19). The position was reported as 18°59.4'S, 174°45.4'W (18.99°S, 174.757°W). Minor fumarolic activity was occurring in the crater and there was a noticeable smell of sulfur. Plumes of discolored water were present in the surrounding area. The higher-angle views of the island showed an area that had eroded to just below the ocean surface, possibly reflecting the previous extent of the island. Figure 18. Low-angle aerial photographs of Home Reef, 7 December 2006. The top view is looking NNE towards Late Island in the background. The bottom view is looking S. Courtesy of the RNZAF and IGNS. Figure 19. High-angle aerial photographs of Home Reef, 7 December 2006. The top view is looking approximately W, showing that the northern end of the island has eroded to just below sea level. Submarine plumes of sediment are also obvious. The bottom view is looking approximately SE, showing a close-up of the eroding remnant of the island. Courtesy of the RNZAF and IGNS. Floating pumice observations. Pumice from the Home Reef eruption was identified in Terra and Aqua MODIS satellite images as well as being reported by sailors and Fijians (BGVN 31:09 and 31:10). A compilation of all of these sources (figure 20) seemed to indicate that two major tracks were taken by most of the pumice. Initially, all of the pumice went N, then WNW across the ocean towards Fiji. Approximately midway to Fiji, some of the pumice turned on a more westerly course then moved south before impacting Vatoa and passing the southern Lau Islands enroute to Kadavu and Vanua Levu. Another batch of pumice continued on a WNW course, penetrating the northern Lau Islands to Taveuni, the Koro Sea, and Viti Levu. Both groups of pumice eventually passed W of Fiji, with some getting to Vanuatu in November. Most of the pumice appears to have been generated during 8-10 August, but there may have been smaller pumice-creating eruptions that were not documented. Figure 20. Map showing approximate paths taken by pumice generated by the Home Reef eruption in August 2006. Paths between Tonga and Fiji during 8-26 August (shaded areas) are based on MODIS satellite imagery (see text for further explanation). Paths through Fiji are more speculative, being based on point observations by sailors and reports of pumice washing into bays and on beaches. Base map from Google Earth. Prepared by GVP. Satellite imagery revealed not only the paths taken by pumice rafts, but also their changing morphology. Although cloud-cover was a problem, the MODIS images did show enough pumice zones to allow their areas to be sketched (figure 21). Note that all dates and times in this section are UTC. During the early stages of the eruption pumice built up and remained in the immediate vicinity of the vent (2120 on 7 August through 2203 on 8 August UTC) (figure 21A). Though clouds prevented a view of the entire raft, at it's greatest extent pumice covered about 140 km2 while still attached to the vent. Figure 21. Sketches of pumice areas on various dates in August 2006 from the eruption at Home Reef. Areas depicted may not be filled with pumice, but have observable pumice scattered within them. Sketch maps show pumice areas (in UTC) on 7-8 August (A, SW section), 10-12 August (A, NE section), 14-17 August (B), 19-22 August (C), and 26 August (D). See text for additional information. The areas were determined by overlaying geographically registered MODIS satellite imagery into Google Earth and using a polygon creation tool to manually determine the pumice extents. Base map from Google Earth. Prepared by GVP. By 0132 on 10 August the main mass of pumice had moved to the N side of Late island (figure 21A). The raft generally remained as a single large coherent feature in that area for at least 20 hours. Over those 20 hours the raft spread from covering about 300 km2 to almost 400 km2 in a contiguous irregular area, more than double the area of Washington D.C. When it began moving NE towards another unnamed submarine volcano, by 0120 on 12 August UTC, the main mass was reduced in size by about 50% and left a "tail" looping towards Vava'u with smaller stray pumice rafts throughout the area. Between 0105 on 14 August and 0135 on 17 August (UTC) the pumice began moving NE and ENE (figure 21B). Pieces of the large raft began to shear off, with currents carrying smaller rafts away and often leaving a trail of connected pumice fragments in the wake. However, a contiguous mass of almost 150 km2 remained 60 km N of Late Island. Over the next couple of days all of the pumice drifted N and continued to string out ENE across the ocean towards northern Fiji (figure 21C). By 2215 on 22 August (UTC) there was still pumice 25 km W of Fonualei volcano, but the farthest identifiable rafts of pumice were 270 km E and ENE of Fonualei. The pumice appeared to form a continuous, connected stream for most of that distance. In other locations the strand of pumice fragments had broken and individual segments had turned, creating multiple parallel lines of pumice spread across the water. By 2150 on 26 August there were three distinct areas of pumice still visible (figure 21D), though they were all greatly diminished in area and starting to be difficult to distinguish through intermittent cloud cover. One area was still a connected, or semi-connected, strand about 250 km long directed to the NE. Another area of pumice about 60 km N-S was within 100 km of the central Lau Islands. The second pumice zone was encountered on 28 August by the Yacht KB1LSY as it approached the islands. Pumice from one or both of these sources had penetrated into the northern Lau Islands and the Koro Sea by 14 September, landing on Taveuni, Naitauba, and Vanua Levu. Pumice was then reported around Koro Island and in the "Bligh Triangle" area between Vanua Levu and Viti Levu starting on 20 September. At least some of this pumice drifted through the passage to Yasawa Island, N of Viti Levu, by early November. The third distinct set of pumice rafts seen in imagery on 26 August extended across an 80-km distance directed SE-NW and was drifting towards the southern Lau Islands. This batch of pumice was encountered on 30 August by the Soren Larsen just W of the central Lau Islands, and is most likely the same pumice that was reported by the Endeavor extending 90 km NE from Vatoa Island on 16 September. On 30 September large volumes of pumice were landing on Kadavu Island, another 350 km from Vatoa. That same day pumice was seen an additional 200 km NW, on the western side of Viti Levu. Although pumice was seen on Efate Island in Vanuatu during early October, it was thought to be from the Ambrym-Lopevi area. Pumice from Home Reef was seen on the W coast of Efate Island on 4 November. Floating pumice was also seen in Shark Bay on the E side of Tanna Island around mid-November (figure 22). Figure 22. Pumice from Home Reef floating in Shark Bay on Tanna Island, Vanuatu, on 19 December 2006. Residents told the photographer that the pumice had appeared about a month earlier. Courtesy of George Kourounis. Pumice description. Scott Bryan received some pumice samples from Roman Leslie via Peter Colls at the University of Queensland, who made some thin sections of the pumices. Initial observations are that the Home Reef pumice sampled are very similar to the 2001 pumice from the unnamed volcano along a submarine plateau south of Fonualei (volcano number 0403-091), about 85 km NE of Home Reef. The pumice is similar in terms of color (darkish gray-green), vesicularity (highly vesicular), and phenocryst content (low, mostly fine-grained). The pumice has the same mineralogy as the 2001 pumice: plagioclase, two pyroxenes (cpx dominant, and probably relatively Fe-rich), and Ti-magnetite. However, the Home Reef pumice has slightly higher abundances of plagioclase microphenocrysts (~ 0.1-1 mm). Small polymineralic clots of plagioclase, pyroxene, and magnetite are distinctive, and most readily visible to the naked eye in the pumice samples; similar polymineralic aggregates were also present in the 2001 pumice. The pumice observed in thin-section have high vesicularities (> 60%). The pumice would have similar bulk compositions to the 2001 pumice of ~ 65-70 wt% SiO2. Eruptive history. The August 2006 eruption is the third confirmed eruptive episode in historical time, with earlier eruptions in 1852 and 1984 (SEAN 09:02). In addition, there may have been activity in 1857, but no eruption was confirmed. Paul Taylor noted that there may have also been another eruption that was occurring when some aerial photos were taken in 1990. No eruption was reported, so any activity probably didn't reach the surface or was not observed. The photos seemed to show a small submarine plume being dispersed to the NW. Information Contacts: Paul W. Taylor, Australian Volcanological Investigations, PO Box 291, Pymble, NSW 2073, Australia; Brad Scott, Institute of Geological & Nuclear Sciences (IGNS), Wairakei Research Centre, PO Box 2000, Taupo, New Zealand (URL: http://www.geonet.org.nz/, http://www.gns.cri.nz/); Scott Bryan, School of Earth Sciences & Geography, Kingston University, Penrhyn Rd, Kingston Upon Thames, Surrey KT1 2EE United Kingdom; Norman Kuring, NASA/Goddard Space Flight Center, Code 970.2, Greenbelt, MD 20771, USA; George Kourounis, Toronto, ON, Canada (URL: http://www.stormchaser.ca/). The new island at Home Reef that was constructed by the 8-11 August 2006 felsic shallow marine explosive eruption (BGVN 31:09) was visited on 18 February 2007 by Scott Bryan (Kingston University, United Kingdom), Alex Cook (Queensland Museum, Australia), and Peter Colls (University of Queensland, Australia). The initial aim of field research was to map and describe the volcanic geology of the new island at Home Reef and to collect samples for comparison to floating pumice generated by the eruption (Bryan, 2007). Island observations. Satellite imagery on 4 October 2006 showed an 800-m-long elongate island (0.23-0.26 km2), which was being rapidly modified by wave erosion (BGVN 31:10). An overflight by the RNZAF on 7 December 2006 revealed a roughly circular island, 450 m in diameter and up to 75 m above the water line (BGVN31:12). Upon arrival on 18 February 2007, the scientists found that only a small (50-75 m diameter) <5 m high low-relief wave-reworked "pumice mound" remained at the southern windward end of the Home Reef shoal (figure 23). Due to strong winds and large swells, landing on the tidally-exposed mound was not possible and it could only be viewed from a couple of hundred meters offshore. The location of the mound (18.993°S 174.758°W) is close to that reported for the circular island observed on 7 December 2006. Swells 2-m high or greater were strongly impacting the mound, with the largest waves almost completely engulfing and sweeping over the mound at half-tide. Figure 23. View to the NW of the wave-reworked pumice mound at Home Reef, as seen on 18 February 2007. The diameter of the mound is ~ 75 m. Note the scattered large blocks on the upper surface of the mound. Late Island is in the background at right. Courtesy of Scott Bryan. The morphology of the island suggests that no primary subaerial island-building deposits remain from the eruption and that complete reworking has occurred of the previously observed cone. On the southern side of the pumice mound were scattered large (>1 m diameter), outsized blocks (10-20 in number) on the mound surface (figure 23) that were largely immobile in the waves. Slopes of the mound reflected wave run-up and the pumiceous material comprising the mound appeared to be relatively coarse and well-sorted. There was little entrained particulate material in the water column downwind and downcurrent, but considerable amounts of material within the surf zone surrounding the island, coloring the water brown. A considerable area of discolored water (green, translucent milky) extended N of the mound for more than 500 m. Several smaller lobes or plumes extended off the W side of the main body of discoloration. A strong sulfurous odor was detected downwind (NW) of the mound, indicating that magma was continuing to cool and degas at shallow levels in the seamount seven months after the eruption; no surface plume was visible. Surface water temperature measurements did not detect any thermal anomalies, recording ambient water temperatures (28-29°C). Local pumice sightings. Downwind and downcurrent of the mound were small scattered pumice stringers forming orange-brown slicks a few meters to tens of meters long, characterized by low pumice clast abundance and size (usually 0.5-1 cm diameter). The pumice fragments were generally moderate to high sphericity grains, but some more platy pumice fragments were also sampled. Some clasts had orange to brown surface stains, reflecting hydrothermal alteration since the eruption. Most grains showed some signs of abrasion. Orange-brown algal clumps or coagulates floating on the ocean surface were associated with the stringers. Small pumice rafts were also encountered around some of the islands at the SW end of the Vava'u Group during the week of 17-24 February (figure 24). The pumice rafts had lateral extents of tens of meters, but other flotsam (leaf, twig, sea grass and plastics) was also present. Pumice clast sizes ranged from ~ 2 mm up to 6 cm, and some of the gray pumice possessed orange-brown surface hydrothermal staining. Some rafts had abundant attached fauna, dominated bygoose barnacles (Lepas sp.) ~ 2-7 mm long. Much of these pumice rafts reflected remobilization of previously stranded material from neighboring beaches, and many SE-facing beaches had been stripped of pumice by strong SE trade winds. Figure 24. Pumice slick from Home Reef found on the W side of Nuatapu Island, 21 February 2007. Note other flotsam (leaves, plastic) within the slick. Courtesy of Scott Bryan. Many beaches had several pumice strandline deposits, the lowermost of which reflected tidal sorting. Dominantly lapilli-sized gray pumice formed the deposits, whereas a black glassy, moderately vesicular pumice of higher density was a notable feature of the highest strandlines. There were also abundant pumice clasts with an orange-brown staining on clast surfaces. Floating pumice reaches Australia. Pumice rafts and beach strandings were reported previously as the pumice drifted westward past the Lau and Fiji islands and on to Vanuatu in November 2006. A major influx of pumice reached the E coast of northeastern Australia during March and April 2007, seven to eight months after the eruption. Pumice was first noticed passing the offshore islands of Willis Island (16.30°S, 149.98°E) in early February, and Lizard Island (14.66°S 145.47°E) the last week of February. Pumice strandings along the eastern Australian coast began in March in northern Queensland, with a substantial stranding occurring in mid-April corresponding to a change to easterly and northeasterly onshore wind conditions and king tides. This stranding event extended for more than 1,300 km along the Queensland and northern New South Wales coast. Most stranded pumice clasts ranged in size from 1-4 cm diameter, with the largest clasts up to 17 cm diameter. Pumice clasts were fouled by a variety of organisms, primarily goose barnacles (Lepas sp.) up to 2.7 cm long, molluscs, bryozoa, and dark green algae (figure 25), with serpulids, oysters and other species of algae (e.g., Halimeda) less abundant. A substantial proportion of stranded pumice material remains on beaches inshore from the Great Barrier Reef. However, little stranded material has remained on exposed beaches south of 25°S, to the extent that some beaches still have more pumice preserved from the 2001 eruption of an unnamed Tongan seamount about 85 km NW of Home Reef. Figure 25. Closeup of a pumice clast from Home Reef that reached Marion Reef (19.095°S, 152.390°E), Australia, fouled by goose barnacles (Lepas sp. ), bryozoa, and mollusc. Coin is 2 cm in diameter. Courtesy of Scott Bryan. Seismicity. Although no seismicity has been reported that was detected during the eruption, Robert Dziak identified seismic signals from Home Reef in March 2006. The East Pacific hydrophone array maintained by NOAA recorded 52 earthquakes over a 12-hour period beginning at 1700 UTC on 12 March 2006. The arrivals were all very clear and had medium to low T-wave amplitudes. Reference. Bryan, S.E., 2007, Preliminary Report: Field investigation of Home Reef volcano and Unnamed Seamount 0403-091: Unpublished Report for Ministry of Lands, Survey, Natural Resources and Environment, Tonga, 9 p.
Information Contacts: Scott Bryan, School of Earth Sciences & Geography, Kingston University, Kingston Upon Thames, Surrey KT1 2EL, United Kingdom; Peter Colls, School of Physical Sciences, University of Queensland, St Lucia, Queensland 4072, Australia; Robert Dziak, NOAA Pacific Marine Environmental Laboratory (PMEL), Hatfield Marine Science Center, 2115 SE Oregon State University Drive, Newport, OR 97365, USA. Pumice from Home Reef has become one hypothesis for some mid-2007 observations on beaches in eastern Papua New Guinea, about 250-350 km NE of Milne Bay. The Rabaul Volcano Observatory (RVO) received a report about quantities of pumice on Woodlark Island beaches on 21 August 2007. The report was from the Deputy Administrator (DA) of Milne Bay Province who had been on election duty in a PNG Naval Patrol boat. The DA and the captain saw an echo sounder profile as they were sailing out of a lagoon at Budibudi Island (Lachland Islands) ~ 100 km ESE of Woodlark Island on the evening of 18 July 2007. They interpreted the profile as a possible submarine volcano. Later, they observed pumice clasts lying on the beaches of the Woodlark Islands. Recalling what they had seen on the echo sounder profile at Budibudi Island the previous day, the DA was very concerned that any activity the area would be a threat to the local population. Additional information was gathered by RVO from the DA, government officers on Woodlark Island, and people from Budibudi Island. That investigation revealed no evidence of a pumice raft on Budibudi. Pumice clasts were only observed on Woodlark beaches, and images of pumice clasts showed that they were rounded and had incrustations. The lagoon at Budibudi also has no history of hydrothermal activity. There was also no evidence of continuous local earthquakes prior to or during July. Simon Carn of the University of Maryland Baltimore County confirmed no evidence of anything unusual in the SO2 imagery. The UK Hydrographic Office provided scans of nautical charts of the remote islands, confirming that the site of the reported "eruption" was less than 35 m deep, so any activity would have been vigorous at the surface and obvious to Islanders. It is assumed that the "submarine volcano" was a patch reef and the pumice was from the Home Reef eruption. Another alternative was that the pumice represented re-mobilized clasts from strand lines around the Solomon Sea, possibly a result of the 2 April Solomon Islands tsunami. Information Contacts: Herman Patia, Rabaul Volcano Observatory (RVO), P.O. Box 386, Rabaul, Papua New Guinea; Simon Carn, Joint Center for Earth Systems Technology, University of Maryland Baltimore County (UMBC), 1000 Hilltop Circle, Baltimore, MD 21250, USA (URL: https://so2.gsfc.nasa.gov/); Guy Hannaford, United Kingdom Hydrographic Office, Admiralty Way, Taunton, Somerset TA1 2DN, United Kingdom. The Global Volcanism Program has no synonyms or subfeatures listed for Home Reef. Home Reef, a submarine volcano midway between Metis Shoal and Late Island in the central Tonga islands, was first reported active in the mid-19th century, when an ephemeral island formed. 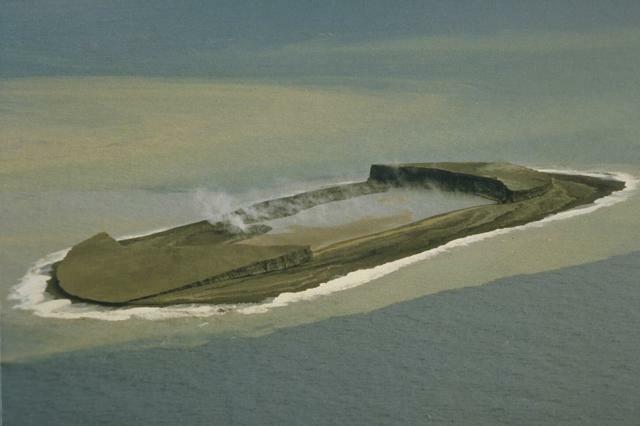 An eruption in 1984 produced a 12-km-high eruption plume, copious amounts of floating pumice, and an ephemeral island 500 x 1500 m wide, with cliffs 30-50 m high that enclosed a water-filled crater. Another island-forming eruption in 2006 produced widespread dacitic pumice rafts that reached as far as Australia. Vaughan R G, Abrams M J, Hook S J, Pieri D C, 2007. Satellite observations of new volcanic island in Tonga. Eos, Trans Amer Geophys Union, 88: 37,41. There is no Deformation History data available for Home Reef. An eruption of Home Reef in the Tonga Islands in March 1984 produced an island with an estimated size of 500 x 1500 m and a height of 30-50 m. A plume to 12 km height was reported during the March 1-5 eruption, and large amounts of floating pumice were later encountered by passing ships. This photo, taken on March 23, shows water discoloration surrounding the ephemeral island. Photo by P.J.R. Shepherd (Royal New Zealand Air Force; courtesy of John Latter, DSIR, published in SEAN Bull., 1984). A partially eroded pumice cone formed during an eruption that began on August 7, 2006, is seen from the north on December 18. By the end of the year wave erosion had destroyed the cone. Floating dacitic pumice from this eruption traveled as far as Australia. Home Reef, a submarine volcano midway between Metis Shoal and Late Island in the central Tonga islands, was first reported active in the mid-19th century, when an ephemeral island formed. Eruptions in 1984 and 2006 also formed islands. Photo courtesy of Royal New Zealand Air Force and Institute of Geological & Nuclear Sciences, 2006. Steam clouds rise above a new island being built by the eruption at Home Reef as seen from the east about 2.8 km away on August 12, 2006. The island at this time was ~1.5 km in diameter. The eruption began on August 7 and lasted until about the 16th. Widespread pumice rafts reached Fiji and as far as Australia. Photo by Fredrik Fransson, 2006. Floating pumice partially fills North Bay along the southern coast of Kadavu, Fiji, on September 30, 2006. This photo was taken about seven weeks after a submarine eruption at Home Reef, in the Tonga Islands, began on August 7. Wide tracks of floating pumice extended across the SW Pacific, and by March and April of 2007 had washed up along a 1300-km-long stretch of the eastern Australian coast. Photo by Roger Matthews, 2006 (published in GVN Bulletin). Large Eruptions of Home Reef Information about large Quaternary eruptions (VEI >= 4) is cataloged in the Large Magnitude Explosive Volcanic Eruptions (LaMEVE) database of the Volcano Global Risk Identification and Analysis Project (VOGRIPA).